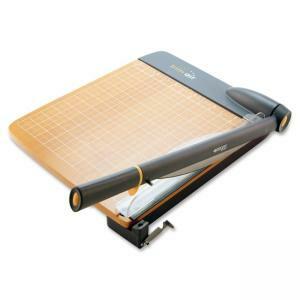 Acme United Westcott TrimAir Guillotine Trimmer - Cuts 30Sheet - 12\"
Guillotine trimmer features an ergonomic handle infused with Microban to inhibit the growth of bacteria. 12" titanium-bonded blade cuts up to 30 sheets of 20 lb. paper. Blade is curved for optimum cutting performance. Contemporary design features a wood base, comfortable handle with safety guard, safety lock and transparent safety guard to keep fingers safe.